This year's Bowman card design is among my favorites of all-time. They are sleek, crisp and futuristic without venturing into the year 2075 like all too many brands these days. One of the best parts about Bowman Draft is that you would be hard pressed to find a bad case of the "bowman bends" unlike chapter II in the 2010 Bowman trilogy, 2010 Bowman Chrome, which had one of the worst cases I can remember. The stock is comparable to the chrome cards that came out of 2010 Bowman baseball (Chapter I). I'm not sure whether they used different stock or if being sandwiched around non-chrome cards is the reason for the flat nature of Draft's chrome cards. Manny Machado, Bryce Harper, Steve Strasburg, Jameson Taillon, Christian Colon, Zack Cox, Delino DeShields' son, Buster Posey, J-Hey, Dom Brown, Michael Choice, Bryce Harper, the list goes on and on. The checklist is fantastic, 23 of this year's first round picks make an appearance on Draft's auto checklist. On top of that, Draft delivers AFLAC and USA autos. One of the best parts about this year's Draft is the strong 2010 rookie class that surrounds the outstanding prospect crop. Jason Heyward, Buster Posey, Mike Stanton and Stephen Strasburg himself make an appearance in the base set. One of the most underrated aspects of the checklist is the fact that USA players are part of the Bowman Draft Prospects checklist instead of an insert set. This difference means that the "First Bowman Chrome Card" tag applies to the set's USA participants. This makes the USA cards far more collectible in my eyes. 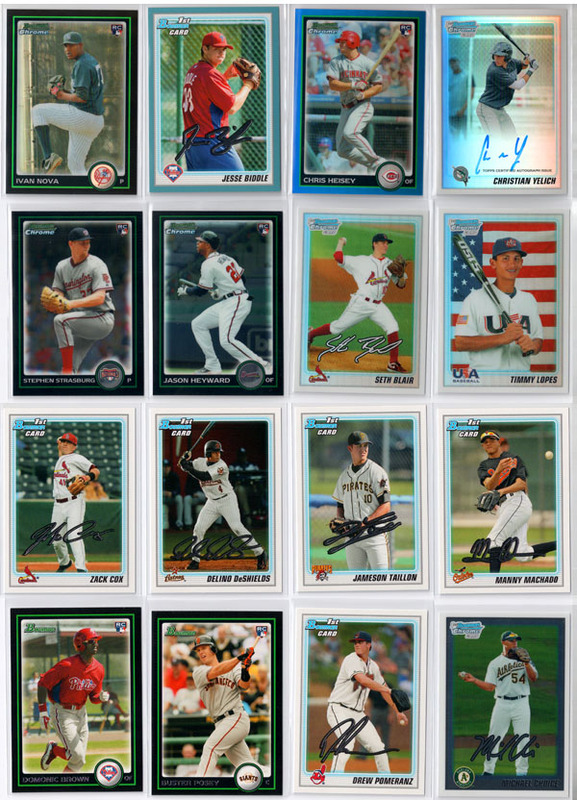 I'm not a fan of the insert USA cards, as it feels like statutory prospecting. A combination of an A+ prospect auto checklist, the 2010 rookie class, AFLAC autos and various levels of refractors and parallels add up to a fantastic box value. For $60-$70 per box, you'd be hard pressed to find a better value when it comes to baseball prospecting products. The only real complaint I have is that there's only 1 autograph per box, which means there's zero margin for error. I wish they made jumbo boxes of draft like they do with regular Bowman. There's nothing more exciting than opening a new Bowman product filled with a fresh checklist of prospects to get acquainted with. This year's checklist features an unprecedented amount of top picks from the 2010 MLB Draft. I enjoyed Bowman Draft even more so than Bowman Chrome due to the depth of the checklist and the fact that the checklist is restricted to all rookies and prospects. If you enjoy prospecting, 2010 Bowman Draft is prospecting at it's best. When you combine 2010 Bowman Baseball, 2010 Bowman Chrome Baseball and 2010 Bowman Draft, you end up with arguably the best collection of rookie and prospect autos in the history of Bowman. The third chapter in the 2010 Bowman trilogy is every bit as good as the first two. The card design is fantastic, the checklist stacked with 2010 first round picks, 2010 rookies and USA baseballers. The great part about Bowman Draft is that it delivers nothing but big name rookies and prospects, I have nothing against veterans, but when it comes to Bowman products, they can get a bit annoying. 2010 Bowman Draft is as good as prospecting products get. Each $70 hobby box delivers 1 autograph and a host of additional RC's, refractors, USA cards, prospects and an outside chance of pulling an ever elusive AFLAC auto or the even more elusive superfractor, of which only a handfold of living collectors have ever laid eyes on in person. 2010 Bowman Draft Picks& Prospects Hobby Box Stanton,Posey Machado???? Looks awesome! Hope to get my hands on one of these boxes. How comes the retail boxes have two hits while the hobby boxes have only one? The retail boxes are considerably cheaper- are the Bryce Harper autos exclusive to the hobby boxes?